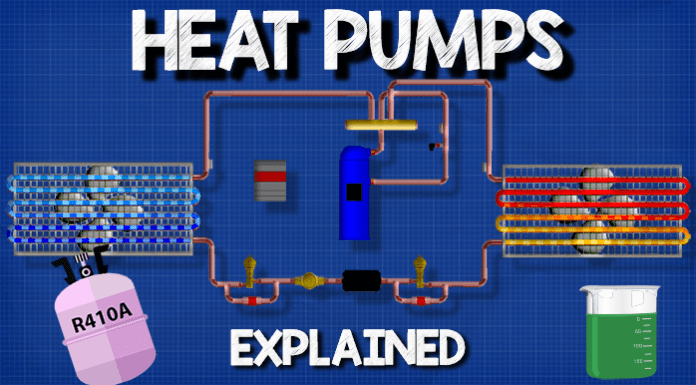 Heat Pumps Explained. 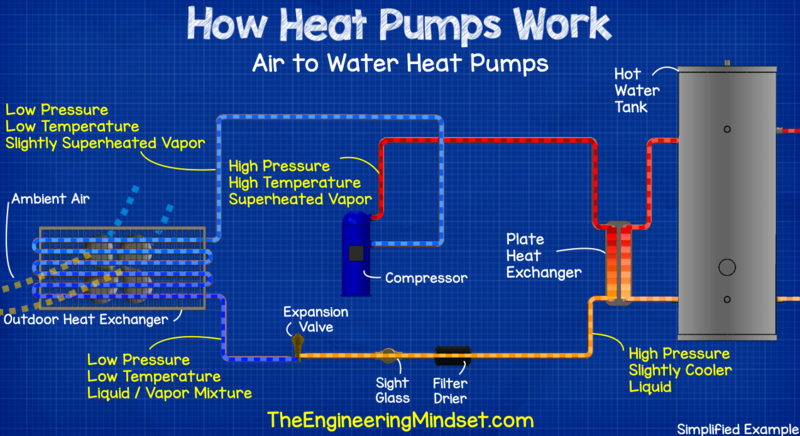 In this article we’re going to be discussing heat pumps and how heat pumps work. 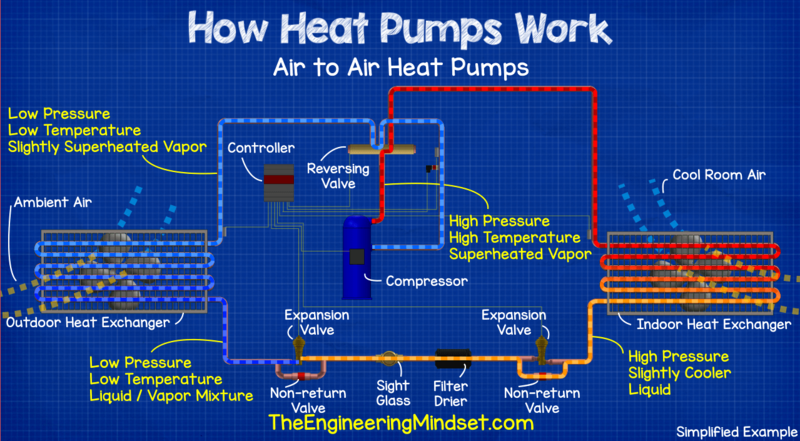 We’ll look at he different types of heat pumps, their applications as well as animated schematics for each to build our HVAC engineering knowledge. We’ll cover How heat pumps work, Air to air heat pumps, air to water heat pumps, ground source heat pumps, water source heat pumps. A critical aspect of heat pumps is how energy efficient they are, and Danfoss has everything you need to make sure your heat pump is running with what they call “360° energy efficiency”. 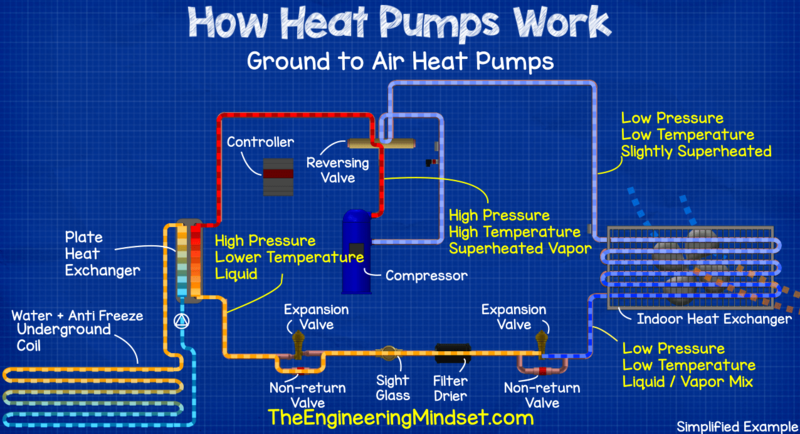 They even built a heat pump website that has business cases, case stories, eLessons, and even a fun diagram similar to the ones you see on this channel, so you can see how it all comes together. Ok the first thing we’re going to look at is the air to air heat pump. 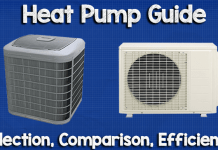 These are the most simple heat pump types. They often look very similar to a standard air conditioning split unit with a unit located outside and another unit located inside. These can either work as a heating only device, alternatively the more popular choice is to have a device which can provide both heating and cooling by making use of a reversing valve. We’ve covered how reversing valves work in our previous video tutorial, click here to watch that. 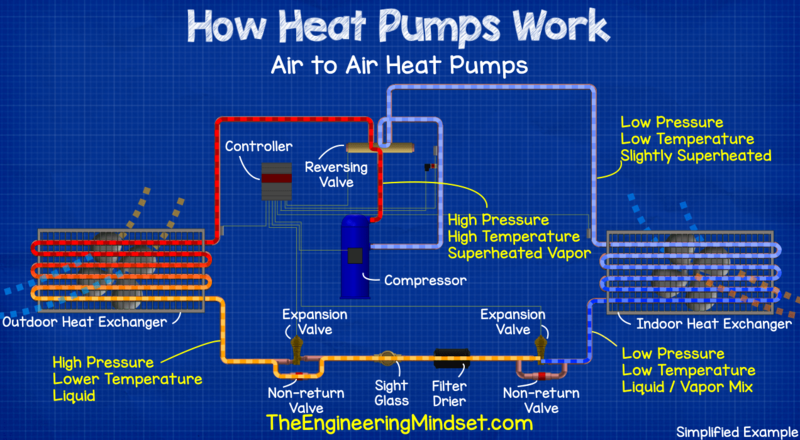 There are a few different ways to configure a reversing heat pump but I’ll show you a simple, typical example. The main components we’ll have are the compressor, the reversing valve, the indoor heat exchanger, an expansion valve with a non-return valve bypass, a bi-directional filter drier, a sight glass, another expansion valve with a non-return valve bypass, then we have the outdoor heat exchanger. We also have a controller and a number of temperature and pressure sensors around the system. In a heating mode the refrigerant leaves the compressor as a high pressure, high temperature vapour and passes into the reversing valve. The reversing valve is positioned into heating mode so the refrigerant passes through and heads to the indoor unit. Cool air is blown over the indoor unit heat exchanger to remove some of the thermal energy and provide heating to the room, as heat is removed the refrigerant condenses. Having given up some of its energy the refrigerant leaves as a high pressure, slightly cooler, liquid. The refrigerant then comes to the expansion valve and bypass, the expansion valve is closed so the liquid refrigerant passes through the non-return valve, through the filter drier and sight glass and then passes through the expansion valve because the non-return valve on this side is preventing the flow. As the refrigerant passes through the expansion valve the refrigerant expands in volume and turns into a part liquid, part vapour mixture. This expansion in volume reduces the temperature and pressure. We’ve covered how thermal expansion valves work as well as how electronic expansion valves work click the links to learn about those. The refrigerant then heads to the outdoor heat exchanger. Here, a fan is blowing outside ambient air over the coil and adding heat to the cold refrigerant. The refrigerant boils at a very low temperature and as it boils it will carry thermal energy away. As an example we know that water will carry thermal energy away as steam when it boils and we know it boils at 100*C (212*F) well if we look at some common heat pump refrigerants, R134a has a boiling point of -26.3 °C (-15.34*F) and R410A has a boiling point of -48.5 °C (-55.3*F). So its very easy to extract thermal energy even at very low outdoor temperatures. We’ve covered how refrigerants work in a previous video, again links down below for that. So the refrigerant picks up thermal energy from the outside air and leaves the outdoor heat exchanger as a low pressure, low temperature slightly superheated vapour and heads back to the reversing valve. The revering valve then diverts this to the compressor to repeat the cycle. If the system is switched into cooling mode, the system then acts like a normal split air conditioner. The compressor forces the high pressure, high temperature vapour refrigerant into the reversing valve, the reversing valve diverts this to the outdoor unit. The fan of the outdoor unit blows ambient air across the heat exchanger, this air will be a cooler temperature so it carries the thermal energy of the refrigerant away. The refrigerant condenses as it loses its thermal energy. It then leaves as a high pressure, low temperature liquid refrigerant. It then heads to the expansion valve but this is closed so the refrigerant passes through the non-return valve, through the sight glass and then the bi-directional filter drier. The next non-return valve is then closed so the refrigerant passes through the expansion valve. As it passes through the expansion valve the refrigerant changes to a part liquid, part vapour mixture which causes it to drop in pressure and temperature. It then flows into the indoor heat exchanger and a fan blows the warm indoor air over the cold coil, this causes the heat to transfer from the air into the refrigerant and so the refrigerant boils and takes this heat away. The refrigerant leaves the indoor unit as low pressure, low temperature slightly superheated state and flows into the reversing valve. The valve diverts this into the compressor to repeat the cycle. These units work in a similar manor but without the reversing valve. The high pressure, high temperature vapour refrigerant leaves the compressor but this time heads into a plate heat exchanger. On the other side of the plate heat exchanger water is being cycled through a hot water storage tank. Cool water enters the heat exchanger from the tank and as it passes through the heat exchanger it absorbs the heat from the hot refrigerant, so it will leave much hotter and flow back to the hot water storage tank. As the refrigerant gives up its heat to the water it will condense and will leave the heat exchanger as a high pressure, lower temperature liquid. We’ve covered how heat exchangers work in our previous tutorial, click here to watch the tutorial on heat exchangers. The refrigerant then passes through the filter drier and sight glass then into the expansion valve. The expansion valve causes the refrigerant to become part liquid, part vapour and at low pressure and temperature. It then passes through the outdoor heat exchanger where the outdoor ambient air causes the refrigerant to boil, the refrigerant then leaves as a low pressure, low temperature slightly superheated vapour and is sucked back into the compressor. The hot water tank then provides hot water to the radiators, sinks and showers in the building. There are two main types of ground source heat pumps, that being horizontal or vertical type. Both essentially work the same it’s just how they access the heat in the ground that varies. We’ll look at when to use the different types as well as the pros and cons in our next heat pump article, this article is just focusing on how they work. Ground source can be used for heating air or water. In the air type system, the heat pump can also have a reversing valve and then supply either heating or cooling. In both cases the outdoor heat exchanger can be a plate heat exchanger with the refrigerant passing on one side and a mixture of water and antifreeze cycling on the other side. The water and antifreeze mixture is forced by a pump around the pipes in the ground. This will allow it to pickup the thermal energy in heating mode and bring this to the heat exchanger, the refrigerant on the other side of the heat exchanger absorbs the heat because it has a very low boiling point so as it boils it carries the heat away and can then be used within the building. In the air type system there can be a reversing valve. This will allow the refrigeration system to pull unwanted heat out of the building and transfer this into the water antifreeze mixture. This water will then be pumped around the pipes in the ground and it will transfer the heat into the ground, returning cooler ready to pick up more heat. Water source heat pumps come in two main variations. Closed and open loop. The closed loop takes thermal energy from a pond or river and sends this to the heat exchanger. Open loop pulls water from an aquifer or river and pumps this to the heat exchanger. In a closed loop type a water and antifreeze mixture cycles around the pipes to collect thermal energy and bring it to the heat exchanger where the refrigeration system will then absorb the energy and use it for heating. Alternatively, it will dump the buildings unwanted heat into the water antifreeze mixture to provide cooling to the building. The unit then works the same as a ground source heat pump. In an open loop type, the water is pulled in via a pump and sent directly to the heat exchanger. The heat exchanger then pulls thermal energy out of the water or it dumps the unwanted heat into the water. The water then passes through the heat exchanger and returns to the source, some distance apart. I have a new 1 story ranch house in the Charlotte North Carolina area with an air source heat pump with an outdoor and indoor unit. The unit uses R410A refrigerate. The outdoor unit is installed next to the house with the lines entering at the base of the house , running up a 2 x 4 stud wall with fiberglass insulation . Once in the attic the lines cross over to the horizontal installed air handler unit. The line set length is approximately 30 feet between the units. When the system is operating in cooling mode the noise of the system is limited to the external unit and mostly the fan operation. When the system is operating in heating mode the noise is both the external fan operation but also a high pitched, humming, vibrating noise that is heard on the inside of the wall where the lines run but also across multiple ajoining rooms. I have opened the wall and moved the lines to the back side of the external wall. This is then covered with fiberglass insulation and 1/2 inch drywall. Can you please explain why there is a significant difference in the noise level between cooling and heating mode? Could this be caused by a defective component or is this normal operation? Can you suggest any modifications, upgrades or repairs that can be made to eliminate the excessive noise.